“Bad credit” doesn’t have a technical definition, but it is generally used to describe a low traditional credit score. We don’t look at applicants’ traditional credit score, but the things that can give you a lower credit score — defaulting on debts and making late payments on bills, for instance — may be factored in when we evaluate your application. If your financial history shows a pattern of not honoring debts, your application may be declined. If you are a UK resident and want to learn about bad credit in the UK, check out QuickQuid's Guide to Bad Credit Loans. While there are unscrupulous companies in every industry, the payday loan and cash advance industry is particularly rife with lenders that make false claims and offer dangerous products. Because of this, CashNetUSA takes our commitment to transparency seriously when it comes to payday loans and claims of “bad credit” or “no credit” loans. Although we don’t offer “bad credit payday loans,” our custom alternative credit check process doesn’t look at your traditional credit score. Additionally, applying for a payday loan with CashNetUSA does not affect your FICO® score — so the best way to know if you are eligible for a CashNetUSA loan is to apply for one! If you’re eligible, make sure you’ll be able to repay any loan you take out before signing your contract. Failure to repay or repay on time can make it harder to get any sort of loan or credit with us in the future. Lastly, CashNetUSA cannot help you improve your “bad” credit or help you build credit if you have none — our services are here to help you when you have a financial emergency that you need to deal with between paydays. 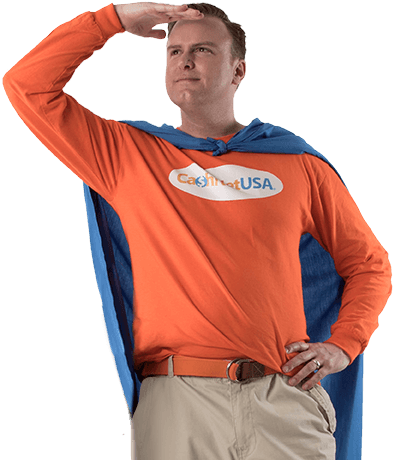 CashNetUSA’s payday loan amounts vary by state but are generally for less than $500. Check out our Rates & Terms page for more details. Our application is quick and easy and takes most people just a few minutes to complete. Since 2004, we have has helped more than 3 million hard-working Americans receive the cash they need, when they need it most. Our highly trained customer support team is available seven days a week, and collectively we strive to make CashNetUSA the best choice for payday loans.